No matter how incredible your products and websites are, if your logo isn’t perfectly designed, you will definitely experience a hard time while gaining the attention of customers towards your product. The logo is simply not a necessary part of your product, rather it represents and holds the brand name of your business which you need to present in the best possible manner. Our life is completely surrounded by logos. Right from the beginning of the day until the late hours we encounter bundles of app logos all around us. Isn’t it? So, it becomes necessary to have a compelling and a strong logo which clearly defines your business objective and is worthy enough to attract potential customers. In fact, most of the expert designers sometimes fail to design a perfect logo. 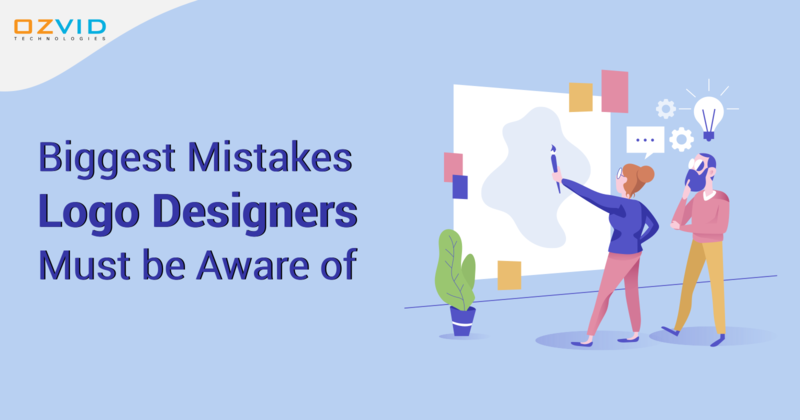 But to save your time and efforts, we have prepared a list of necessary mistakes which might end up in wrong logo designs. Go through them and make sure your designer doesn’t commit them while designing your logo. No doubt, staying up to date according to the latest trends is a necessity in the ever-changing world. But don't forget that trends come and go. And while you think about designing a logo, it needs to be timeless which doesn't fade away with time or when the trends change. Otherwise, your logo will soon turn into cliches. Your company logo is carrying your brand name and it must be unique enough. So, instead of running behind the trends, make sure that the logo you decide is worthy enough to deliver your motto and is unique to catch customers eyes. Using a good typeface can turn into an amazing logo, while a bad choice of typeface can present miserable results. And of course, you can't risk your logo over a wrong typeface. The designer needs to take a wise decision while picking a typeface for your logo. Using multiple typefaces for a single logotype is just not acceptable while you get your logo done. You must choose a typeface which clearly conveys the message of your brand. It is good not to opt for more than two typefaces for your logo design. One of the most common mistakes which designers commit is the selection of colors. The designers must understand the psychology behind colors in order to design an appealing logo for your business. Make sure that the colors you choose exactly resemble the objective behind the logo, and the message you want to convey to your customers. A well-planned choice and strategy of colors become necessary. Moreover, you need to check your logo in black & white and grayscale. An ideal logo must look good in both black & white as well as in color forms. So, you must not hurry while choosing the colors and think wisely while making a choice. Whenever designing a logo, you must keep in mind to use images which ensures visual consistency across multiple sizes. Using raster images is just not preferable as it results in producing blur picture on increasing the size. Since you have no idea of when you have to create a zoom picture of your logo it is good to opt for vector graphics that scale the logo to the possible size without affecting its quality. You simply can't admire a company's logo and copy it. You have your own brand and you need to have a unique logo for your brand. There are certain startup companies who try to copy logo of well-renowned organizations like Amazon or Starbucks, and end up in paying a good amount when caught. You must try to ask your designer to design something innovative and different from the other competitors. If you are planning to get your logo designed, it is necessary to be aware of all the mistakes that can be done while designing a logo. In order to get the perfect design of logo, it is good to rely on the company like OZVID Technologies. It has the best logo designers with years of experience in the designing industry. Still not convinced? Get in touch with us and know more about us!